Studio Vlock’s environmental awareness encourages the use of natural materials and their ability to change and evolve with time and the weather. In its unfinished state, steel rusts and weathers through oxidation. This won’t affect the structural integrity or durability of the piece. As a re-purposed object, weathering enhances the aesthetic of the artwork. Grinding the surface removes marine paint or rust revealing a natural steel lustre, which is then hand rubbed with industrial wax to maintain this gorgeous finish. Hand rubbed, patinated finish creates a rich burnished look, and a more refined appearance. Classic colors available. 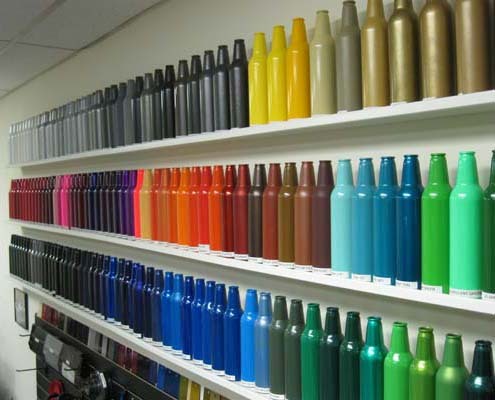 Industrial marine-grade paint is applied to the interior and exterior surfaces to maintain its appearance. An excellent choice for extreme weather conditions. A certified, architectural grade finish. Highly durable, a powder coat finish will not chip easily, or get that ‘chalky’ appearance over time. Color options are infinite. Corten or “weathering steel” eliminates the need for painting and forms a stable rust-like appearance after several years exposure to weather, making it highly sustainable. Cold-rolled steel has a superior surface finish but will rust over time in it’s natural state, especially in a coastal environment. If natural weathering is not preferred, cold-rolled steel can be marine-grade painted to maintain consistent color and protect it from rust and corrosion. Stainless steel is corrosion resistant and will maintain its bright luster. 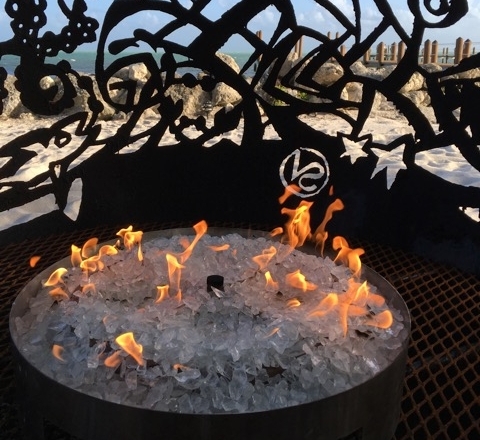 Both 'Fireballs' and Fire Screens are designed for wood burning, propane or natural gas. Studio Vlock does not provide propane or gas burner assemblies, however we can suggest guidelines and specifications. Available in three sizes: 58", 40", and 28" diameter – designed for wood burning, propane or natural gas. Each Tri-fold Table Screen is three-sided and hinged to invite a flexible arrangement of shapes, closed or open, easily changed and reconfigured. 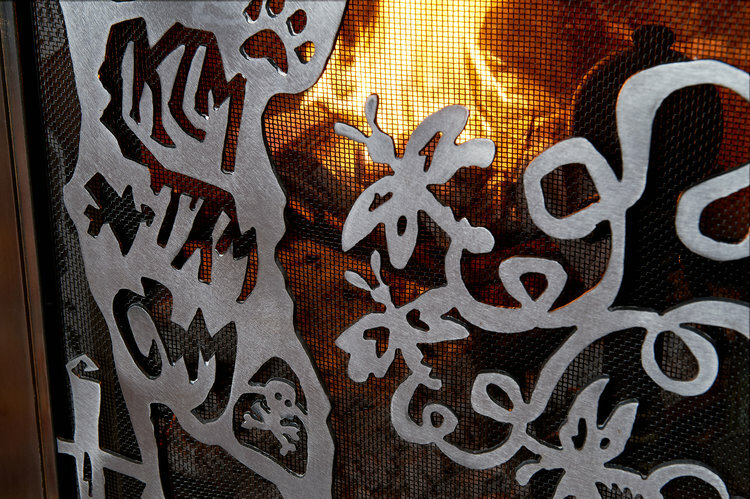 Fabricated out of high grade stainless steel, these pieces may be enjoyed inside or outside. Imagery is inspired by nature or custom designed to support a brand, personalize an interior, or capture a sense of place. Tri-fold Table Screens come in standard sizes or any size to meet your specifications. Studio Vlock's Fine Art & Architectural Elements includes repurposing hard to find vintage steel fishing net floats. This limited collection of lanterns, are both functional light spheres and intriguing objets d’art. Each small treasure—typically 7 1/2” or 8” in diameter—are one-of-a-kind; often with stamped markings, ribbing, and marvelous fittings. Shown here is “Horse Play”, a boat-shaped table/pendant light fixture in stainless steel. Three sizes are available to suit any contemporary architectural design environment. The flexible design allows for the piece to sit on a table or be pendant hung. The stainless steel bottom plate is a perfect surface for arranging tea lights. The bottom plate is easily removed. The pendant may be custom fit for length and wiring. Decorative Fire Screens are designed to order for a custom fit – at home in any environment; whether traditional or modern interior. Designed for gas, propane or wood burning fireplaces. For more information about your Fire Screen, please read below. 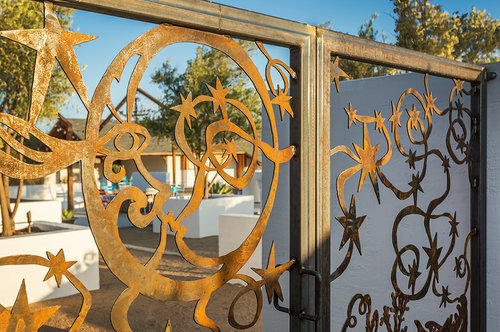 Each Fire Screen is either custom fit and secured or designed to be free standing. To bring out the sheen or remove fingerprints or rust, use Mothers brand Pure Brazilian Carnuba Wax. The material used for the exterior frame and image panels is cold rolled steel to achieve a superior surface finish. The image panels may have a patinated or bright sanded finish. The interior frame for the mesh screen is stainless steel. We apply a high temperature auto paint on the mesh screen so it won't burn. A patinated finish is applied to the exterior frame and door frames using acid black oxide. This process involves grinding off mill scale, then using scotch bright on the surface and applying acid oxide The acid is rubbed on with scotch bright to achieve desired color and density then neutralized with water. An anti seize lubricant is used on the screws securing the frame to the lintel and mesh screen to the frame to assure easier disassembly if required. For wood burning fireplaces, the stainless steel frame inside is designed with a spacer to hide the bolts, making it easier to change out the mesh screen (if ever) and replace if needed. Mesh screen is stainless steel, finished with a high temperature auto paint so it won't burn. The stainless steel frame inside is designed with a spacer to hide the bolts, making it easier to change out the mesh screen (if ever) and replace if needed. For fireplace glass panels, we use a heat­ resistant glass ceramic such as NeoCeram, which is recommended for use as fireplace glass doors. It can handle temperatures well into 1,200° Fahrenheit, or 3x the heat resistance of tempered glass and is also more resistant to rapid heating and cooling. NeoCeram will not fog up in these instances of extreme heat and does not 'need to breathe', like regular tempered fireplace glass. Studio Vlock will provide crating and coordinate transport to any location worldwide. As fine art, each piece is accompanied with a Certificate of Authenticity for collector documentation and insurance purposes.